Have You Met: John Harnois, Keeper of the Feathered Kind? John Harnois of Harnois Farms in Whitmore Lake, Michigan, raises all kinds of free-range poultry: turkeys, ducks, geese and chickens. But let’s face it, it’s time to talk turkey! Real Time Farms: What’s your most hilarious encounter with a turkey? John Harnois: Well, you know, the biggest output of turkeys is poop. Especially in the fall, when it rains, things become quite the quagmire cause they’re pooping up a storm and its raining. There is a flight incline where their yard is and they don’t want to go in, so you’re trying to maneuver in a place where you can’t. So, while trying to move these turkeys, I’ll often go sliding and land in a big puddle of mud and poop. I usually start to get mad at the turkeys but then can’t help but laugh cause they’re turkeys and you’re covered in poop! RTF: Who would win in a leg wrestling contest between a duck and a turkey? JH: Turkey. Have you seen a duck’s legs? They are teeny-tiny. You could use turkeys legs as a billy club. They are big, muscular, and tough. If you’re careful, you could hold a turkey by its legs, but you couldn’t do that with a duck. So a turkey would win… wings down. 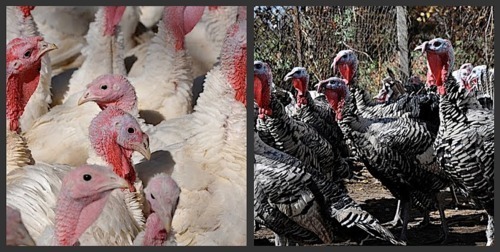 John raises broad-breasted white turkeys (pictured below left) and heritage turkeys (pictured below right). Broad-breasted whites are the most commonly sold turkey and the largest. They grow very quickly and cannot reproduce on their own and so require in vitro fertilization due to their large proportions. Committed to the survival of the turkey through the maintenance of genetic diversity, John also raises an heirloom breed of turkey, the Narrangansett, known for its unparalleled flavor. RTF: What makes your turkey special? JH: I don’t know. They are really flavorful, moist, and they run around outside. Until they go for ice cream, they’re well taken care of, well-loved. Why are my eggs so flavorful? I don’t know… that’s the million dollar question. If I knew what makes them so special, I could probably do an even better job of raising them. Nonetheless, I read them bedside stories, take them cups of water, tuck them in, and make sure their heads are tucked under their wings. RTF: Why should people invest in heritage turkeys? JH: That’s an easy one… You got to eat them to keep them alive. There are lots of strains of non-heritage breeds. If they aren’t bred, they will soon be extinct. We want to keep as good a variety of genetics in the gene pool as possible. If there is nothing to back up on, what are you going to do? You’re screwed. There won’t be any turkeys around and we’ll all be eating “tofurky” for Thanksgiving. Plus, I think they’re just better. They are expensive to raise, but they’re really, really good! RTF: How were turkey sales this year? JH: Not bad. We started with about 220 and we now have about a dozen left. I’m still waiting for some people to get in touch with me, but we expect to have most of them sold by Thanksgiving. John encourages all to support their local farmers and businesses. He sincerely hopes that people appreciate what he does, and he needs to know they do. It’s a lot of work for not a lot of money, he says. “Why am I doing it?” he asks, “I need to know people care in order to continue”. He doesn’t know if he would continue if it weren’t making a difference to people. It has been a very difficult year for him and it can be very stressful—there have been truck failures and trailers not showing up when he is depending on them; Feed costs have gone up 20-30%, but it is difficult to raise prices because people might not continue to buy his poultry. “Is it worth it? Do people appreciate what I do? If not, I could have less stress and just get a job at Costco. I’d probably even make more money doing that. You have to be nuts to get into this field. It would be nice if I could just raise it and give it away, but I’m not able to do that,” he says. Nonetheless, John continues because he cares about the birds he raises and the customers he sells them to. If you haven’t bought your turkey for Thanksgiving yet, give John a call at 734-645-0300. 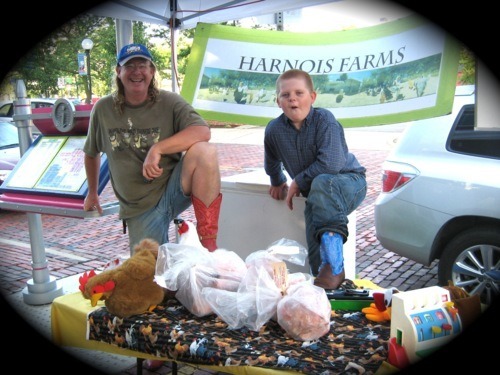 Harnois Farms sells only really wonderful turkeys raised by really wonderful people. And let him know you appreciate what he’s doing, lest we lose one of the best natural poultry farmers in the area to Costco! Can’t get enough of John? Check out these great interviews in The Washtenaw Voice, WCBN-FM Ann Arbor, and Ann Arbor.com’s Farm to Fork Series. This entry was posted in On the Farm and tagged broad breasted turkeys, heritage breeds, heritage turkeys, john harnois, lindsay partridge, local food, naragansett turkeys, tukeys. Bookmark the permalink.